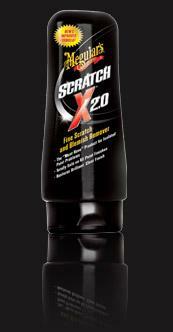 Meguiar’s for isolated scratch and scuff removal, ScratchX 2.0. This new formula has been specifically developed for hand application to quickly remove isolated scratches, fingernail marks, paint transfer and parking lot scuffs. Unique micro-abrasives correct these defects fast and are completely clear coat safe. Not just a “cover-up”, ScratchX 2.0 is a special formulation designed to completely remove scratches, ensuring that once they are gone, they stay gone! The 'Must Have' product for isolated paint problems. Totally safe on all paint finishes.